We take a holistic approach, by carefully blending the ancient “Gurukul” model with the modern tools and technologies for imparting the knowledge from the instructors to the students. Are you a businessman ? Improve your business strategies using the New Digital Marketing techniques with DigitalSkillMaster and experience the change of growth. Searching for some SEO Tips? Join our Workshops for solving your querries in Digital Marketing. Why Advance your Digital Marketing Training with Us? Digital Skill Master Academy, originally started as an informal digital training institute in the USA. Our founder Tony John directly handles all corporate digital marketing trainings. Topics and syllabus custom designed and handpicked for you on Flexible timings. Business Executive Digital Consulting Program for Strategic digital consulting for your business. SpiderWorks Technologies, a leading digital marketing company in Kerala, realized the shortage of skilled digital marketing professionals. That’s the primary reason behind the inception of Digital SkillMaster, the digital marketing training academy in Kochi, Kerala. Industry thought-leaders to help you master new skills. Get a pay-raise, a promotion, or start a new career. Well, our digital marketing training programs are prepared and enhanced over a decade of research and practical experience in making businesses successful online and training people from all walks of life. We have trained Students, Educators, Marketing Professionals, Sales Executives, Entrepreneurs, Small & Medium Business Owners. software architect, IT consultant, professional blogger and a well known Digital Marketing Strategist, with over 1.2 Lakhs followers on Facebook and Twitter. Blogging started in 2008. KSRTC is pleased to announce a blog on his website. For the past one year, TRADE Travel & Eat is being done by technology & travel videos in Malayalam. Over six lakh followers in Facebook and YouTube now. Various training classes are handled in digital marketing. Sujit Bhaktan is one of the leading influential bloggers in Kerala. YouTube certified vlogger, and social media consultant and tech blogger in Kerala. Various training classes are handled in digital marketing. Over 198k followers on Facebook and Youtube. one of the leading social media strategist in Kerala. Our 1 month SEO course is designed for people looking for job or freelancing opportunities without investing a lot of time. With over 15 years of experience in marketing websites over the internet, our founder Tony John directly handles all corporate digital marketing training. If you don’t have the time to attend our comprehensive digital marketing training programs, the 1-day workshops are ideal for you. At this workshop, business owners and marketing professionals will learn the real-world state of social media with latest trends and tools for cost-effective digital marketing. Come and join us to learn how to effectively promote your business and improve your ROI using Online advertising, Facebook, Instagram, Twitter, LinkedIn and Search Marketing with actionable tactics for your business. At this workshop, business owners and marketing professionals will learn the real-world state of social media and search engine with latest trends and tools for cost effective digital marketing. Come and join us to learn how to effectively promote your business and improve your ROI using Online advertising, Facebook, Instagram, Twitter, LinkedIn and Search Marketing with actionable tactics for your business. If you are looking for a job oriented digital marketing training in Kochi, handled by the experts in the industry, Digital Skill Master is the place to be in. Our digital marketing training materials are prepared and enhanced over a decade of research and practical experience in making businesses successful online and training people from all walks of life. All our digital marketing trainees from our past batches are successfully placed in good companies in Kerala and across the globe with excellent pay packages and benefits. How do you get to the top of the competition in the digital era? Well, that’s a very simple question with a lot of complicated answers! Digital Skill Master, one of the leading digital marketing training institute in Kochi, Kerala can simplify all those complicated answers for you. Our comprehensive digital marketing training program equips you to find simple solutions to sophisticated problems through our proven strategies to make businesses succeed, taking advantage of the opportunities in digital marketing. Our parent company has more than a decade experience in the digital marketing segment. Digital Skill Master offers various classroom and on project training programs on proven digital marketing strategies and techniques through our well crafted digital marketing courses. 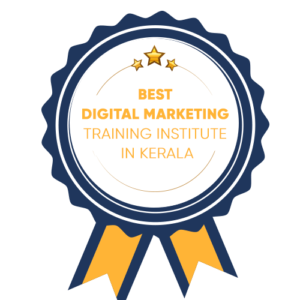 Digital Skill Master digital marketing training institute is operating in our permanent building in Kochi, sharing about 2500 sq ft premium office space with our digital marketing agency. Our Wi-Fi enabled digital marketing training institute classrooms are equipped with an individual computer for every student and have all the equipment like projector and televisions for effective coaching. All computers are connected with hi-speed internet connection from multiple internet service providers. Up to 2 days of power backup ensures uninterrupted learning even during long hours of power failure. Executive seating arrangements ensure a comfortable learning experience, even during long hours of sessions and practicals. You are welcome to visit our digital marketing institute in Kochi and take a look at our classrooms.